For the voracious consumer, who sees games only as something to devour rather than savour, that mightn’t seem like particularly good value. Everyone else, however, should buckle up and settle in for a breathless modern arcade classic that delivers more thrills per minute than almost anything else out there. 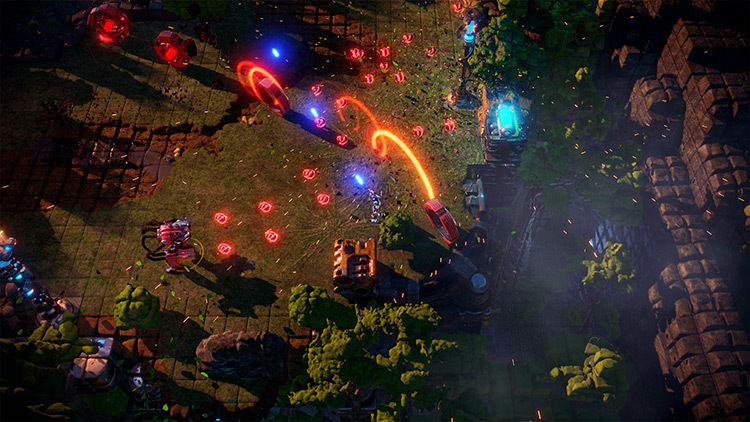 With solid mechanics, insane levels, and beautiful design, Nex Machina cements Housemarque as the king of twin-stick shooter development. 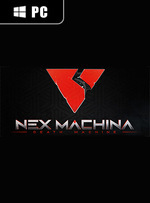 As a long time fan or a newcomer to the genre, Nex Machina is great addition to the SHMUP games list. It hits all the right notes and offers a satisfying experience. Available on both PC and PS4, this is a game I would recommend for lovers of the genre or those interested in trying out a reimagining of the classic genre. Nex Machina is an utterly fantastic arcade twin-stick shooter that doesn’t so much revolutionize the genre as get almost every aspect just right. The shooting feels great, the dash mechanic gives you plenty of flexibility in getting out of tight spots, all the secondary weapons are unique and useful in their own way, and the enemies never stop coming up with new ways to cause trouble. The swarms of the early levels are joined by dense bullet patterns later on, and survival means learning to use every tool you’ve got both offensively and defensively. Despite the frustrations its upgrade system often caused me, I had a good time navigating Nex Machina’s array of twin-stick shooter challenges. The appealing art, energetic soundtrack, and pixel-perfect gamepad controls made me own every failure and look forward to whatever might come next. Arena mode seems to be where most of the lifespan on this one will come from, and I look forward to seeing people who are better than me at it pull off some crazy runs to climb the rankings. Nex Machina is not for the faint of heart, but a recipe to delight those looking for an attractive, arcadey challenge to overcome. 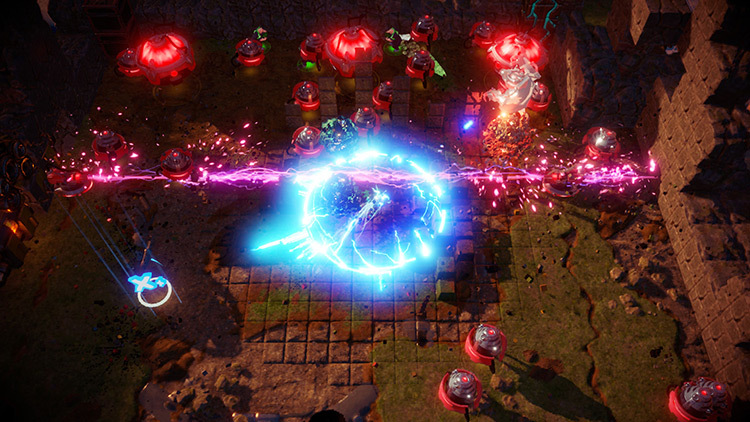 Nex Machina is like a pure dose of adrenaline. The visuals are so detailed, so fluid and so colourful that your eyes nearly pop out of your head trying to keep track of everything. And the soundtrack is utterly fantastic, perfectly matched to the action on-screen, making you tap your foot rhythmically from the minute you start playing. 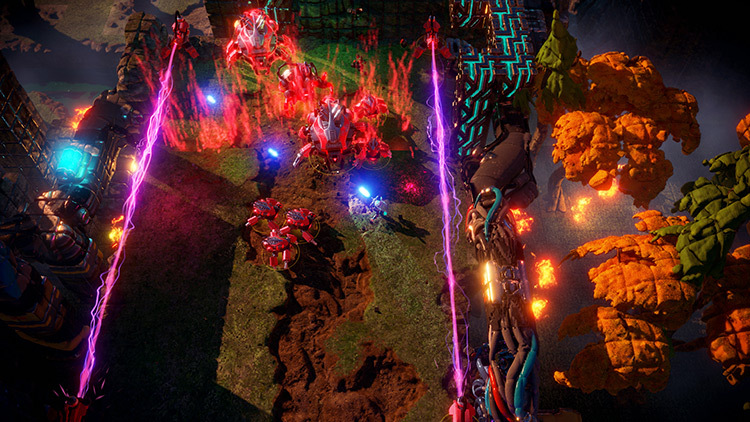 Housemarque has done it again; Nex Machina is a brilliantly action-packed shooter that’s engrossing, addictive and absolutely sublime from start to finish. The movement is snappy and responsive, the feedback from your weapons is satisfying, and the chaos on screen is perfectly balanced and, at times, glorious to behold. We also appreciated the fact that the studio has spread its wings beyond the confines of PS4 (although perhaps the PC version could have done with a few more customisation options, and swapping between input devices wasn't as easy as we would have liked). Nex Machina es diversión de la vieja escuela. Housemarque vuelve a demostrar que es uno de los grandes estudios en cuanto a shoot'em ups de estilo clásico, y adapta una fórmula ya veterana a los nuevos tiempos con mucho acierto. Por supuesto un juego de estas características no es para todo el mundo, claro, pero quien desee un entretenimiento rápido, frenético y colorista para pasar un buen rato encontrará aquí la alineación perfecta de astros. 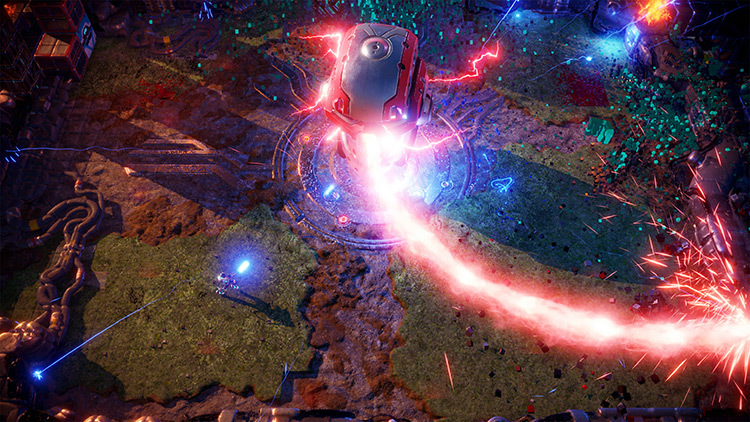 Podemos calificar a Nex machina como el mejor trabajo de Housemarque hasta la fecha, un título que recoge lo mejor del género de la acción de doble stick para llevarlo a otro nivel, eso sí, aprovechando la actual tecnología para ofrecer todo un espectáculo audiovisual. 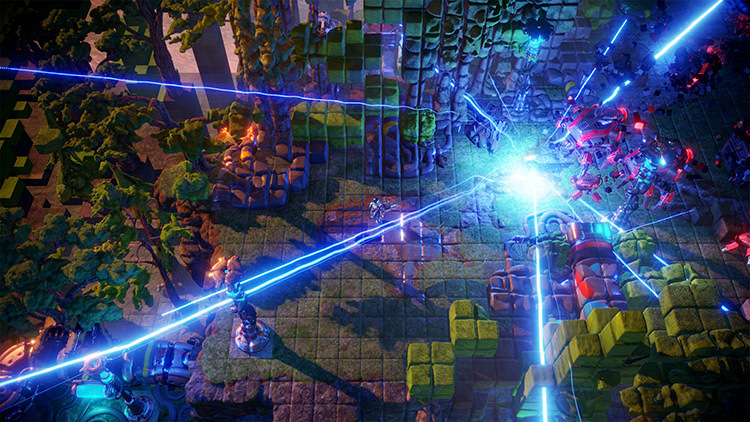 Nex Machina ist ein klasse Twinstick-Shooter, der euch in Null Komma nichts in die Zeit der Spielhallen beamt. Das explosive Erlebnis kann einen unnachahmlichen Sog entwickeln, in dem man wie eine Flipperkugel von Stage zu Stage geschossen wird: Kaum hat man eines der kleinen Areale gemeistert, katapultiert einen die schwungvolle Kamera in das nächste. Dabei ist die DNA von Resogun spürbar, so dass man ähnlich offensiv den Sprint dosieren muss, um sich sowie alle Menschen zu retten. In Nex Machina stehen Präzision und Ad-hoc-Entscheidungen im Mittelpunkt. Wann ich mich wo hinbewege und wann ich welche Herausforderungen abschließe, ist für das Knacken des nächsten Highscores entscheidend. Die Enge der Levelarenen provozieren riskante Manöver, bieten aber dadurch zugleich die Möglichkeit, kreative Laufwege zu finden. Die Platzierung der Gegner ist nie unfair und rhythmische Bewegungen werden von Nex Machina belohnt. Dans une marée de twin stick shooters médiocres inondant le marché, et à l'ère des mondes ouverts et des niveaux générés procéduralement, Nex Machina nous emmène dans une expérience régressive qui saura séduire les amateurs de scoring ainsi que les joueurs plutôt en quête d'un jeu restreint en contenu mais à maîtriser sur le bout des doigts. Nex Machina è il gioco perfetto per una sessione di gioco breve, ma in cui concentrare una dose di azione, di esplosioni e di ritmo tali da saziare l’appetito videoludico per un bel po’ di tempo. Peccato che quando la fame torna, Nex Machina non ha molto altro da offrire, come molti altri suoi elementi, la co-op in locale è un tributo ai tempi che furono, ma la presenza di una più moderna modalità online avrebbe di certo garantito una maggiore longevità, che forse in futuro verrà raggiunta tramite nuove modalità ed espansioni.